Mindwatch: Nobel for ICAN - Japan says "I Can't"
ICAN, the International Campaign to Abolish Nuclear Weapons, has won the 2017 Nobel Peace Prize, after helping to usher in a new consensus, including the United Nations Treaty on the Prohibition of Nuclear Weapons adopted last July (text here). Unfortunately, Japan has not yet become party to the treaty. Well-prior to the question of signing on, Prime Minister Shinzō Abe's government even boycotted deliberations (as did Brit PM Theresa May & toadying Australia). 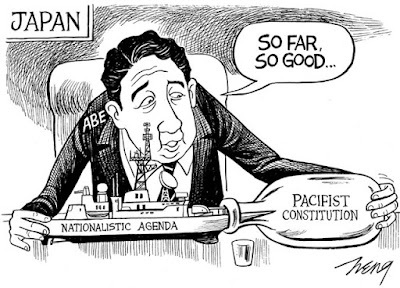 The people of Japan are strongly anti-nuclear, but they've become a neutered pet poodle alongside the heavily nuclear-armed USA. 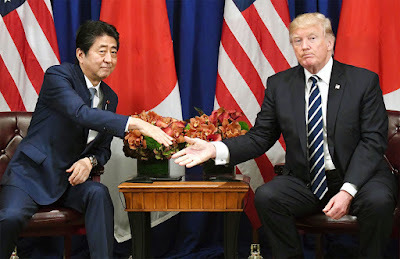 Instead of using experience and wisdom, and developing the goodwill of global Japanese activists, Abe's party has officially shut-down discussion (link). This Nobel Prize draws attention to the fact Abe's at war with his own people, telling thousands of Japanese atomic bomb victims (被爆者 "hibakusha") their suffering is unreasonable & selfish. Until the people of Japan stand up against their right-wing masters, we must regrettably say they deserve our pity -- and our disgust.